In the Special Promotions > New Arrivals category in both Reboot and non-Reboot worlds. Update your character’s look with a Royal Hair Coupon themed to look just like one of the characters from Cardcaptor Sakura: Clear Card! These hairstyles are available for Sakura Hair, Syaoran Hair, and Tomoyo Hair. Please note that certain hairstyles are only obtainable with certain genders, and that these hairstyles cannot be dyed to change color. Check out the Male Hairstyles available now: Highlights (NEW! ), Cowlick Hair, Crow Hair, Baby Angel Hair, and Detective Hair. Check out the Female Hairstyles available now: Trend-Setting Hair, Airhead Hair, Marigold Hair, and Double French Braids! Check out the Male Face Styles available now: Babydoll Face, Straight Shooter Face, Refreshing Face, Big Man Face, A Child's Dream, and Mysterious Concept! Check out the Female Face Styles available now: A Child's Dream, Mysterious Concept, Kiddo Face, Meow Face, Yokai Eyes, and Pudding Face. Sengoku High returns! Oda Nobunaga has taken over the school. You’ll need to fight your way through all the classes before you can face down Mori Ranmaru! Pick up a Sengoku High entry pass in the Cash Shop or Maple Rewards Shop and take it to Oda Nobunaga to attempt the Headmaster's Special Training at any time. As you make your way through Sengoku High, you’ll earn Oda Coins which can be used to purchase items from Sagacious Goemon in the homeroom! Get your hands on totems, medals, pins, the Kimono Box (receivea random equip item with a 30-day duration), and the Sengoku School Bag (receive a random item such as effect coupons, chairs, scrolls, potions, and more). In the Special Promotions > Limited Time category in Reboot and non-Reboot worlds. Drape yourself with the Hydrangea Kimono outfit package, which contains permanent items! Return to Sengoku in style with these permanent items! Do you need a fun chair for when you're hanging out in Maple World? Use the Chair Gachapon Ticket, guaranteed to give you one amazing chair! And if you purchase it now, you can get it at a discount! Enjoy the special seats of the Jiggly Egg Chair, the*Monster Box Chair, the*Henesys Camouflage Chair,*and the Octopus Tank*Chair. Sit down with some friends with the One-Hit Wondroid Chair*and the*Sleepy Bird Chair! Take a seat on all sorts of things with the*Angelic Adoration*Chair, the*Beast Tamer's Critter Champ Party Chair, and the*Cherry Blossom Picnic Chair! Settle in with the Chick Keeper Chair, the Chicken Dream*Chair, the*Chickie Wrap Chair, the*Firely Forest Chair, and*the*Pantheon Camouflage Chair. Get some rest and prepare for battle with the*Super Giant Mushroom Chair, the*Teatime with Madeleine Chair, the*Romantic Teacup Chair, the Teatime with Sharyl Chair, the*Von Bon's Fury Chair, and the*Warm Kotatsu Chair! After purchasing the Chair Gachapon Ticket, double-click the item while in Cash Shop to move the ticket to character's inventory. 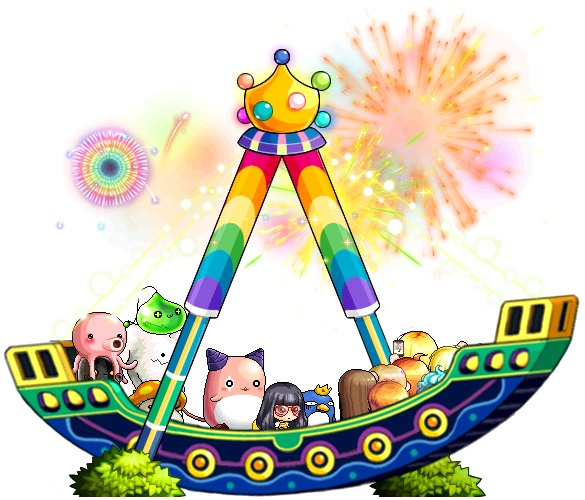 Exit the Cash Shop then use the Chair Gachapon Ticket to receive one amazing chair! All chairs are tradeable (non-Reboot worlds only) and permanent. Spread your wings with the Black Butterwand Package and Rose Butterwand Package, which contain permanent items! Available*in the Special Promotions > Limited Time category in non-Reboot worlds only. Take home a beautiful permanent Unicorn pet of your very own! Choose from the elegant Tiel, the mysterious Esel, or the sweet Galiel. Summon 2 of these pets to obtain the Bjorn mount skill. Summon 3 of these pets to obtain the Unicorn mount skill. Both of these mounts will increase your Speed and Jump. Available*in the Special Promotions > Limited Time category in Reboot worlds only. Characters from Cardcaptor Sakura: Clear Card are coming to Maple World in this limited-time crossover event! 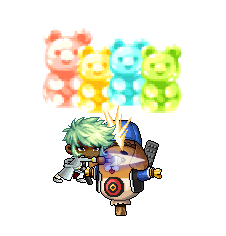 For a limited time, you can purchase a special Cardcaptor Sakura Random Box that contains accessories, outfits, and hats to dress up your MapleStory character. 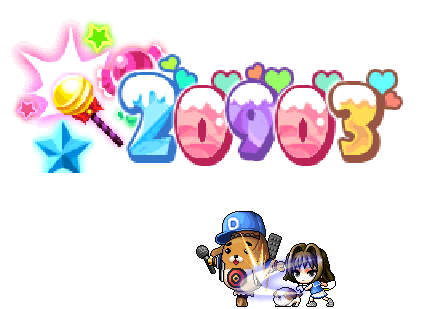 There are 50 different permanent items available from the Cardcaptor Sakura Random Box, providing a mix of items themed for Cardcaptor Sakura: Clear Card, as well as regular MapleStory equips. In non-Reboot worlds, you can trade these style box items with other players through the Cash Item Trade window, if you haven’t equipped them. Right-click on a character to see the menu. Check out the Cardcaptor Sakura: Clear Card items you can find inside the Cardcaptor Sakura Random Box. Left to Right: Sakura Battle Costume Hat, Sakura Battle Costume Outfit, Sakura Battle Costume Shoes, Syaoran Battle Costume Hat, Syaoran Battle Costume Outfit, Syaoran Battle Costume Shoes, Perched Sakura-chan, Tomoeda Middle School Female Winter Uniform, Tomoeda Middle School Female Shoes, Perched Syaoran-kun, Tomoeda Middle School Male Winter Uniform, Tomoeda Middle School Male Shoes, Kero-chan Hood, Kero-chan Bodysuit, Perched Tomoyo-chan, Perched Kero-chan, Hooeeeh! ?, and Superfan Tomoyo. Check out some of the other items you can find inside the Cardcaptor Sakura Random Box. Left to Right: Giant Bright Angel Wings, Dark Devil Gloves, Sweetheart Hat, Sweetheart Shirt, Sweetheart Shoes; Princess Isis; Concert Muse Tiara, Concert Muse Soprano, Concert Muse Heels, Concert Muse, Muse Crystal; Red Rose Label Ring, Red Rose Chat Ring, Concert Muse Tenor, Concert Muse Shoes; Forest Whisper, Silver Wolf, Japanesque Dress. In the Special Promotions > New Arrivals category in non-Reboot worlds only. The Great Gachapierrot has added a ton of new items, including items from Cardcaptor Sakura: Clear Card! 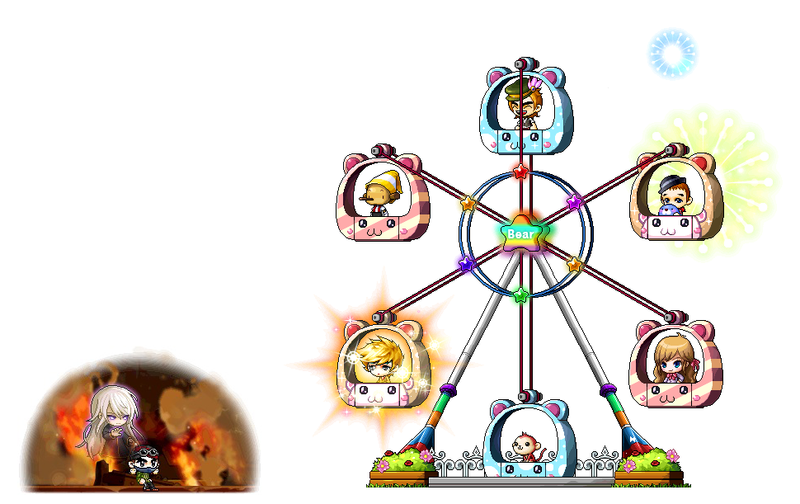 Use a Gachpon Ticket to get one random item such as the Cardcaptor Sakura Chair, Cerberus Mount (permanent and 90-day versions available), The Book of the Clow Cards (pocket item, req. Lv: 30, STR/DEX/INT/LUK +4, Weapon ATT/Magic ATT +4), Clear Card Chair, and Cardcaptor Sakura (title, STR/DEX/INT/LUK +11, MaxHP/MaxMP +100). The Gachapon contains regular MapleStory items in addition to the Cardcaptor Sakura: Clear Card themed items. You may find other items such as the following chairs and mounts. 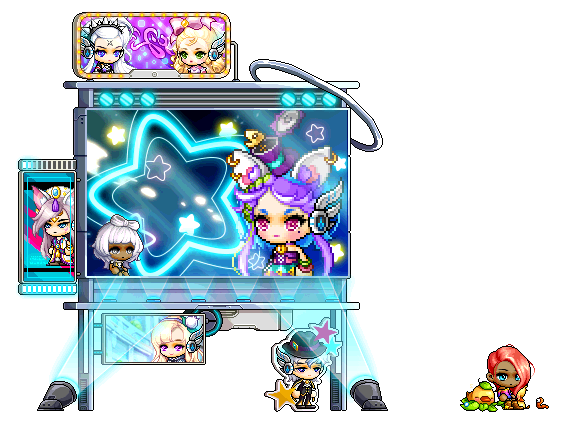 Hang out with the Rock Spirits in the Rock Spirits Chair, enjoy the wonder of Nodestones in the Nodestone Chair, and meet the Moon Bunnies in the Moon Bunny Chair and Slime Launcher Chair. Spend some time outside in the Monkeying-Around Chair, Rainbow Chair, Fun Cloud Chair, and Fairytale Palace Chair. Relax at home in the Hangul Day Chair, Comic Book Lounger, and Chicken Dream Chair. Have fun in the Giant Sushi Chair, Marry Me Chair, and Hilla & Magnus Chair. Watch your Ambition grow with the King of Ambition Chair! As your Ambition levels up to 25\%, 50\%, 75\%, and 100\%, the chair becomes fancier. New mounts are available too! Make new animal friends with the Capybara Mount Coupon, Puffer Submersible Mount Coupon, Giant Rooster Mount Coupon, Flying Blue Sheep Mount Coupon, and Flying Pink Sheep Mount Coupon. These mounts are all available as permanent versions. Take a ride with the Skateboard Mount Coupon, Friend Mount Coupon, Double Aria Assistant Mount Coupon, and Double Phantom Fan Mount Coupon. These mounts are all available as permanent versions. In the Special Promotions > New Arrivals category in Reboot world only. The Conjurer’s Cache is available exclusively in Reboot world, and can be opened to obtain one random item! This box contains items from Cardcaptor Sakura: Clear Card including the Cardcaptor Sakura Chair, Cerberus Mount (permanent and 90-day versions available), and Clear Card Chair. 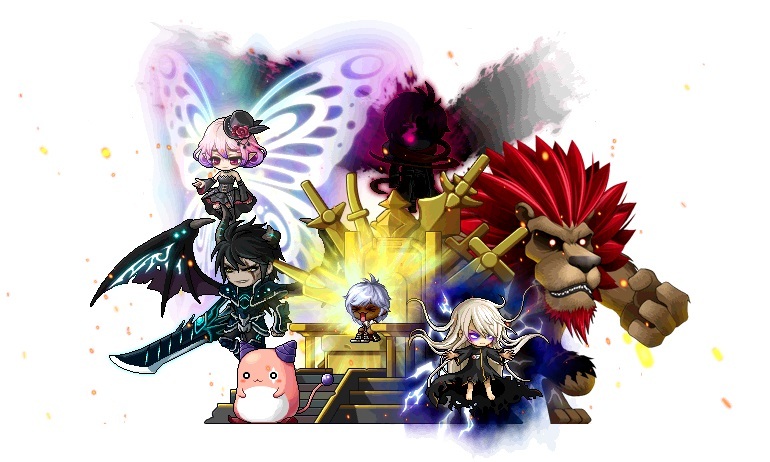 The Conjurer’s Cache contains regular MapleStory items in addition to the Cardcaptor Sakura: Clear Card themed items. You may find other items such as the following chair and mounts. Turn up the heat with the*Blazing Lotus Chair, or go for a spin with the*Ferris Wheel Chair. Check out the*Flame Bird Mount Chair, the*Fame Rank Chair, or the*Cat Nap Chair. You can also hop onto the*Cat Mug Random Chair*or the*Maple Swingboat Chair. Every time you sit in the Cat Mug Random Chair, you'll get a random mug! Open this special version of the Surprise Pet Box to obtain one random pet! It contains both 90-day and permanent pets. You might find a permanent or 90-day Kero-chan Pet from Cardcaptor Sakura: Clear Card! This pet comes with the Meso Magnet and Item Pouch skills. There are other new pets in the Surprise Pet Box! Take home a permanent*Starwing,*Abel, Adel,*Axel,*Star Lotus, Star Orchid,*or*Star Phantom! Make food your friend with a 90-day*Strawbear,*Bananabear,*Cookiebear,*Macha Man,*Lady Hot Tea,*Captain Café,*Kiwi Puff,*Berry Puff, or*Mango Puff! Cuddle up with a 90-day*Ice Knight,*Stjartmes,*Toucan,*Butterfly,*Sassy Snake,*Harp Seal,*Elephant,*Bichon, or*Beagle! Explore the world with a 90-day*Bonkey,*Adriano,*Craw,*Monkey,*Silver Husky,*Brown Puppy,*Mini Yeti,*Penguin,*Porcupine,*Turkey, or*Jr. Balrog! Get a great partner with a 90-day*Baby Tiger,*Black Kitty,*White Bunny,*Pink Bunny,*Panda,*Skunk,*Kino,*Mini Kargo,*Dino Boy,*Dino Girl, or*Frankie! Left to Right: Lalala Goldfish Fishing Net, Lalala Pink T-Shirt, Lalala Dot Skirt; Hangover Make-Up, Note Label Ring, Note Chat Ring, Green Hipster Track Suit; Peach Blossom, Foxy Teacher Outfit, Cloudy Paper Plane Weapon Skin, Tree Spirit; Street Smart Sunglasses, Mechanic Wings, Rainy Day Doll Ring, Blue Phoenix Toga. Left to Right: Hawalu's Teary-Eyed Face Accessory, Rain Puddle Cape, Hilla Robe, Hilla's Shoes;*Deerstalker Cap, Detective Suit, Detective Mush Cape, Oxford Shoes, Calabash Pipe; Clear Day Doll Ring, Rainbow Dreamcloud Weapon, Topsy-Turvy Face, Innocent Outfit. New mounts have also come to Andersen's Box! Get the Blanket Rollup Mount, Dragon Mount, Giant Rabbit, Unicorn Mount, Shaken Wooden Horse Mount, Confession Teddy Mount, and Bouncing Car Mount. These mounts are all available as 90-day versions.